The launch of Fiat Avventura in the past week had silently stirred the long-lost idle segment of hatchback-turned crossover/compact SUVs. The early birds of the said repertoire are Volkswagen Cross Polo, Toyota Etios Cross, and not the least – Ford EcoSport – that also fits the snag here with regards to driving ergonomics. At the heart, all of them arrives with options of petrol and diesel engine both, except for Volkswagen Cross Polo that trails along only a 1.5-litre diesel of 89bhp of power and 230Nm of torque. Amongst the rest, Ford Ecosport offers a wide array of trims that comes with two petrol and one diesel, where in gasoline one is the award-winning ‘EcoBoost’. Terming specifically, 1.0-litre Ecoboost delivers 123.3bhp and 170Nm of torque. The Ford’s 1.5-litre petrol delivers 109.9bhp and 140Nm of torque. Its 1.5-litre diesel unit makes sufficient output of 89.8bhp and 204Nm. Recently launched Fiat Avventura holds the 1.4-litre petrol of 89bhp and 115Nm of torque, and the famous 1.3-liter Multijet diesel in its bay producing 92bhp and 209Nm of torque. The Etios Cross, on the other side, pose for a competitive run for the money with guises of 1.2-litre petrol engine enough for returning 79.1bhp and 104Nm of torque, and a 1.5-litre petrol churning out 88.5bhp and 132Nm of torque. The diesel trim of Etios are powered by a 1.4-litre craving 67bhp of max power and 170Nm of torque. On the transmission side, likewise the engine’s offering, Ford EcoSport manages to rip off a pole with its optional six-speed automatic for the petrol buyers. The rest of them (including EcoSport) come attached to a 5-speed manual gearbox as standard. As already affirmed the EcoSport is totally league apart and is designed properly to cater the compact SUV segment, hatchbacks turned crossovers here falls a bit shorter than it on the sizing note. In length, Ford’s offering measures 3999mm, followed by Avventura that had just fallen short by 10mm at 3989mm. Further disappointed is the Volkswagen Cross Polo which is of 3987mm length, followed by Etios Cross at the last spot with 3895mm. The width too crucifies what is said for the EcoSport earlier, measuring the lead – Ford’s compact SUV – at 1765mm Etios Cross falls shorter to it by 30mm (1735mm). Fiat Avventura here has saved the side flab purposely for aerodynamics, looking out at 1706mm width, and seems VW the Cross Polo too has the same reason to say for its 1698mm. Tallest here is the Ford EcoSport with 1708mm, followed by Etios Cross at 1555mm, Avventura measures 1542mm, and Cross Polo is humble at 1483mm. The inches between two wheels define some clarity of the cabin space, and however EcoSport managed to bag the top-spot for 2520mm of wheelbase. Avventura is the closest rival with 2510mm. Cross Polo measures 2469mm, followed by Etios Cross at 2460mm. When talks are about crossovers and compact SUVs, the ground clearance opens a wide array of terrains to ravage them through, which is sort of impossible for the conventional hatchbacks. It seemed automakers had taken this proportion seriously and these versions of compacts are abreacted with better ground visibility over their siblings. Naming here, first is Fiat Avventura standing with its tall boy looks at 205mm, must say, very impressive! Ford EcoSport has a closest rift at 200mm. Etios Cross comes for a not-so-decent clearance of 174mm, and Cross Polo doesn’t forted to gain momentum in the race, standing behind the rest at 165mm. 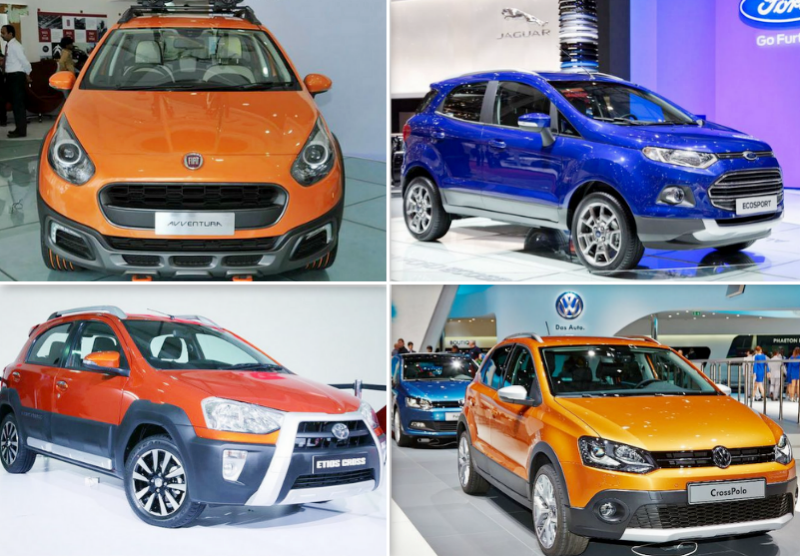 Overall, the comparison had seen close rivalry between Fiat Avventura and Ford EcoSport. So, depending upon the appeals, both of them had enticed us immensely. Etios Cross and Volkswagen Cross Polo seemed totally lost in the game. As already Ford enjoys a good space in the market with its EcoSport, it seemed the success-hungry Fiat is going to have a tough time in selling Avventura that it has crafted painstakingly to make a one more remarkable impression in India.